Cycling England, an advocacy group, is no longer being funded by the country's Department of Transportation. Photo by Ben Kiel. 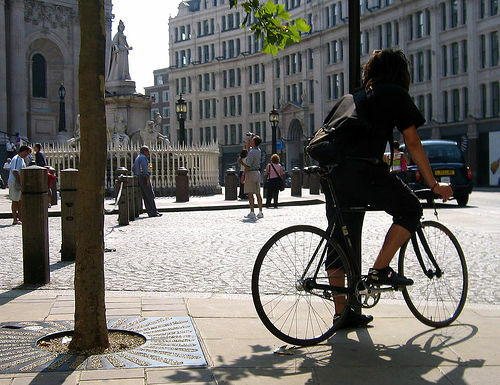 Cycling England, a once government-backed transportation group credited for doubling the number of English children biking to school, is no longer being funded by England’s Department of Transportation. In turn, the cycling group will be replaced within the government by the Local Sustainable Transport Fund, much to the dismay of cycling advocates. HNTB Corportation’s latest America THINKS survey illustrates Americans’ willingness to invest in transportation development. Among its notable findings, the survey found that 74 percent of Americans would be willing to spend more on transportation expenses or taxes if the money was put towards long-term transportation improvements. Vietnam voters called for improved transportation infrastructure in a meeting with Prime Minister Nguyen Tan Dung in Hai Pong this week. An international competition to combat city congestion, Vertical Cities Asia, is calling for students to design urban models for 1 square kilometer of land and 100,000 people, accounting for density, livability and sustainability. Land use coordination is currently the toughest obstacle to overcome in developing North American bus rapid transit (BRT) systems, according to transit operations polled in METRO Magazine’s 2011 report. Funding was the second most-cited obstacle, receiving 23 percent of votes, compared to land use’s 28 percent. Seattle, Wa. took to creative means for developing the city’s southeastern land with a nationwide competition, the 2011 Gerald D. Hines Student Urban Design Competition. Four finalists presented their proposals this week. A revealing national report by Transportation for America found that 69,223 bridges in the U.S. are classified as “structurally deficient,” requiring significant maintenance, rehabilitation or replacement. U.S. transportation safety professionals were honored in Phoenix, Ariz. this week at the annual Lifesavers Conference, the premier national highway safety meeting in the United States dedicated to reducing the tragic toll of deaths and injuries on our nation’s roadways. Abu Dhabi developers delivered a new mandate this week ordering all new buildings in the emirate to conduct a study on its transportation network impact prior to construction. The need for improved bicycle infrastructure and safety in Los Angeles was illustrated this week in a report showing that bike collisions and death numbers are on the rise. Europeans stand strong in their willingness to compromise car components for the sake of the environment, says a new study by the European Commission. The study found that, in exchange for lowering car emissions, 68 percent, 62 percent, 56 percent and 54 percent of individuals were willing to compensate on speed, size, range and price, respectively. According to a new report by the WWF-UK, new U.K. vehicles will need to be at least 15 percent and 20 percent electric by 2020 and 2030, respectively. Seasonal climate conditions bring the University of Minnesota an opportunity to study the important relationship between flooding and urban development. “We need to understand that this is a live, physical, biological system in our midst and we’ve put a human system around it,” Minnesota Professor Pat Nunnally said. The U.S. Environmental Protection Agency updated regulations making it easier to sell systems that convert vehicles from using traditional fuel to alternative fuel. Ireland received €1.5 million from Green eMotion, a European Union electric transport development fund. Green eMotion funding totals €41.8 million for its mission of developing electric transportation knowledge and experience in regions around Europe. Israel-based tech startup company Better Place achieved a breakthrough in electric vehicle charging with the development of robotic battery-swapping stations. Real-time, location-based traffic information has been streamlined, thanks to Vedia Multi-Service. The new system, created principally by Finnish service providers, builds upon previous information-based systems by adding the ability to incorporate multiple information systems on a single mobile device.